A couple of weeks back, Research in Motion (RIM) showed us all, how the upcoming BlackBerry 10 OS would look like when it arrives later this year. The OS is a nice refresh from the BlackBerry OS 7 and one of the features that really wooed us all is the predictive gesture keyboard. If you thought that the keyboard would be all-exclusive to BB10 devices, think again. 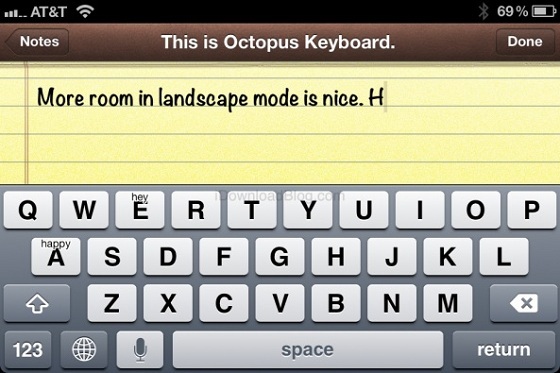 Thanks to developer Mario Hros, now all Jailbroken iPhone users will be able to enjoy the same predictive keyboard on their iPhones with the name Octopus Keyboard. The keyboard’s functionality is nice and smooth even in an unfinished state. But the main question is, Will RIM license the technology of this predictive-gesture keyboard in order stop a rip-off of it from running on any device in the future except BB10 which is still months away from arriving officially. 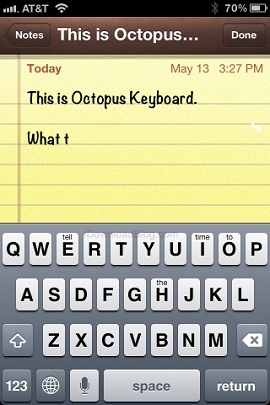 But until then if you wish to try the Octopus Keyboard, then you wont have to wait much longer as it is expected hit Cydia as early as May 20th but we still do not know anything on the pricing of it. Check out the Octopus Keyboard in action below, followed by the BlackBerry 10 keyboard and let us know what you feel about both of them.